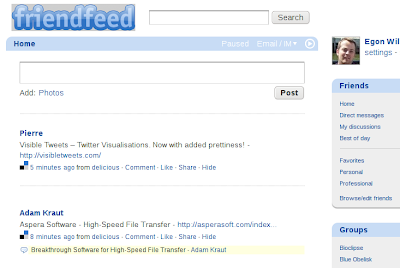 FriendFeed is the missing link between social [bookmarking|news|...] and IRC (#cdk on irc.freenode.net); I quite like it. Anyway, as of today, they have a new layout, and that I do not like. No more icons for feed types, and big avatar photo's. Really, I *know* what my fellow blogger look like (even met many of them in London last year). The rest of the layout is a bit too colourful for my taste. Fortunately, Neil posted three very useful GreaseMonkey script to clean stuff (and since I use those to link science databases and resources anyway, see Christmas Presents and DOI:10.1186/1471-2105-8-487): FriendFeed Service Icons, Cleaner FriendFeed, and Remove avatars from Friendfeed beta. The last may require the script target websites to no longer point to the beta server, but the real thing. However, by the time you read this, the script may already be updated. FriendFeed has less users today than it did last October, according to Comscore. Co-founder Paul Buchheit says that isn’t accurate (and I believe him), but it’s clear that the service hasn’t grown much in the last few months. Multiple inheritence for content types?